These two little lovebirds are in my garden daily. They are very sleek and graceful and their colouring is so subtle that I wasn't sure I could do it justice. They often sit on a bough in the acer tree where they are only ten feet (three metres) from the kitchen window. 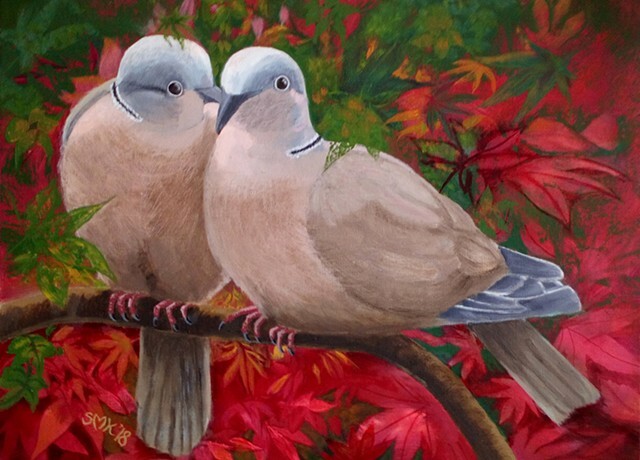 However on the day I saw them 'canoodling' they were on the garden archway, which serves as a bird feeder,and surrounded by autumn leaves. I needed to paint this lovely moment to entrench it in my memory. I thought I would also use it as a Greeting Card for Christmas, and so I gave them the names of JOY and PEACE. And may I wish you the very same.